RSMSSB Mahila Supervisor Recruitment 2018:- Rajasthan Mahila Supervisor Application Form Start Date & Last Date, Download RSMSSB Notification 2018 for Women Supervisor from www.rsmssb.rajasthan.gov.in. Rajasthan Subordinate and Ministerial Services Selection Board, Jaipur (RSMSSB) has given a big opportunity to qualified women candidates who were seeking for a govt. job. The selection board has released Rajasthan Mahila Supervisor Recruitment 2018 on 14th March 2018. Also, Online RSMSSB Mahila Application Form 2018 Apply Online Process Starts from 5th April 2018. If you are still unaware with this good news then you should Check Here Rajasthan Supervisor Vacancy 2018. Find out the complete process of RSMSSB Supervisor Mahila Bharti and its online form details deeply. 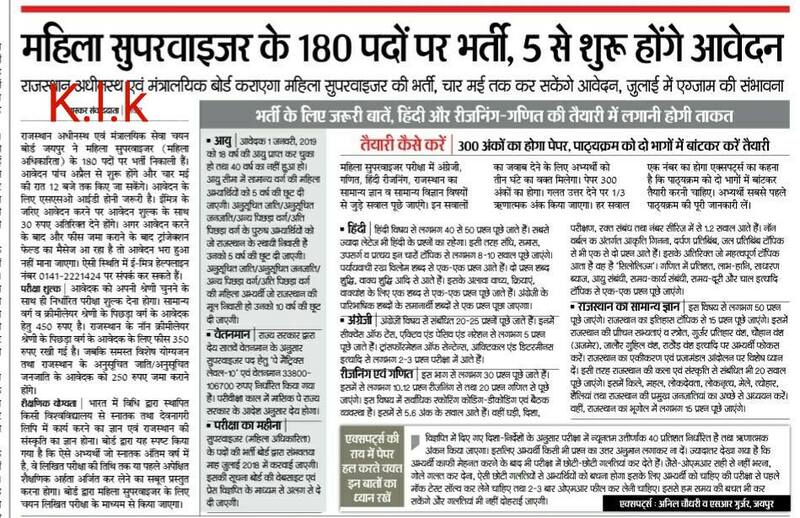 The Rajasthan Govt. 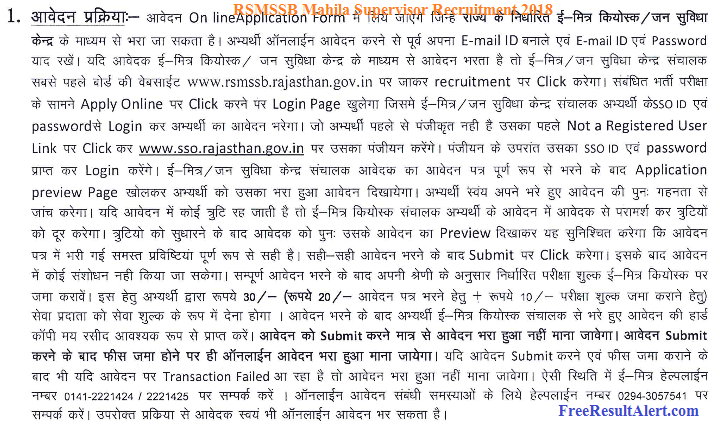 has released Rajasthan RSMSSB Mahila Supervisor Recruitment Vacancy Notification and invited Online Applications Form from the interested candidates. Now you can Apply Online for Rajasthan Mahila Supervisor Vacancy over 180 vacant seats. The Eligibility and Minimum Requirement is disclosed by the official Board in the RSMSSB Mahila Paryavekshak Recruitment 2018 or आंगनवाड़ी सुपरवाइजर विज्ञप्ति. Candidates can check here rsmssb mahila supervisor recruitment 2018 in details and find out their suitability. Note :- यदि आपको RSMSSB Mahila Supervisor Recruitment 2018 & Exam Date से संबंधित किसी भी प्रकार की समस्या हो तो आप नीचे दिए गए कमेंट बॉक्स के माध्यम से पूछ सकते हो हमारी टीम आपकी पूरी सहायता करेगी! RSMSSB can conduct the exam in July 2018, before this it wants all applicants to fill the RSMSSB Mahila Supervisor Application Form 2018 and then Go for the rajasthan women supervisor recruitment. The Online Form Process for Rajasthan RMSSB will starts from First Week of April 2018. Candidates who are fulfilling the criteria according to Rajasthan Subordinate Mahila Supervisor Notification 2018 Apply Online from the link given below. ✵ General / OBC / EBC – 450/- Rs. ✵ OBC Non-Creamy Layer – 350/- Rs. ✵ SC / ST – 250/ – Rs. RSMSSB Interested candidates can go through the direct link and apply today for the recruitment. For more info. follow the official notification. Download the RSMSSB Notification pdf and check RSMSSB Women Supervisor Vacancy 2018 details, important dates etc. Open following web addres i.e. www.rsmssb.rajasthan.gov.in. Scroll Down Below & Click on the “Recruitment Advertisement” option. There, Find & Click on the “Rajasthan RSMSSB Mahila Supervisor Recruitment 2018 Vacancy Notification” link. Download the Full Advertisement for Women Supervisor PDF File. Open and read the complete advertisement. can a man candidate apply for this post mahila superviser ? When will be exam…. ?july month confirm h kya..